Compliance Alert: Effective January 1, 2019, the minimum wage increases to $15.00/hour citywide, and the minimum wage for non-profit organizations increases to $13.50/hour. 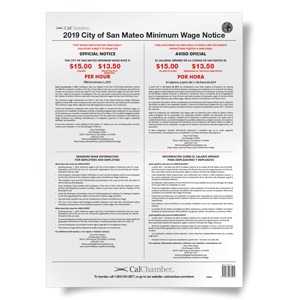 CalChamber’s 16” x 22” San Mateo Minimum Wage poster (English and Spanish combined) contains the official notices with the current minimum wage and minimum wage information as required by the City of San Mateo Minimum Wage Ordinance. 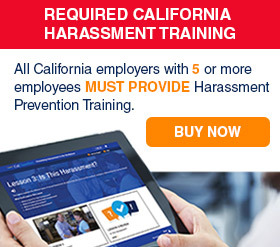 Every employer must post the City of San Mateo's minimum wage notice prominently in areas of the work site where it will be seen by all employees. Employers who fail to comply with the City of San Mateo's minimum wage ordinance may be subject to penalties and civil actions. Employers must post the notification in English and other languages as provided in any implementing regulations.